Auckland (AFP) – Prince Harry and wife Meghan competed at “welly wanging” and were gifted a toy kiwi Tuesday, but narrowly missed out on the ultimate New Zealand experience when a powerful earthquake rattled parts of the country they had left just the previous day. The “Shaky Isles” lived up to their name as the royal roadshow moved to Auckland from Wellington, where the national parliament was temporarily suspended when a deep 6.2-magnitude tremor hit the central North Island. 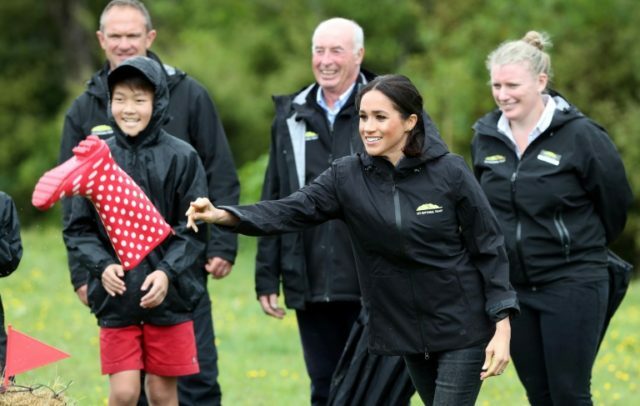 Earlier, Meghan displayed an unexpected talent for “welly wanging”, gaining bragging rights over Harry after they competed in the oddball New Zealand sport. When she married into Britain’s Royal Family in London five months ago, it’s doubtful Meghan envisaged her duties would include standing in a rain-soaked paddock half a world away, hurling a wellington boot into the distance. But as schoolchildren on her team chanted “Meghan, Meghan, Meghan”, the pregnant duchess gave a flick of the wrist and sent her red-and-white polka dot welly sailing past Harry’s best effort. “I think she was thinking that there was no chance that she would win. But she did,” she said. Harry said the charity was a way to “children can have stability in times of turmoil”.